« How Can NC Lawmakers Prevent Vote Buying? 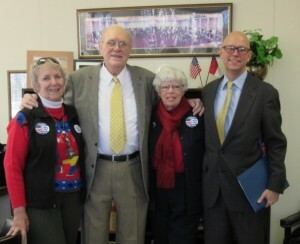 Jan 29, 2015, RALEIGH–The NC General Assembly kicked off the 2015-16 session yesterday and VIP volunteers were there to help find sponsors for their “starting five” reforms to NC election laws. In addition to other proposed legislation, they have not yet completed, the group plans to release more details on the specific language of their first five proposals at a later date. Carol Wheeldon, Sen Jerry Tillman, Dee Park and Jay DeLancy celebrate first day of 2015 session. Today’s meeting was with State Senator, Jerry Tillman, a true advocate for election integrity during the 2013-14 session. The VIP team on the ground was Dee Park and Carol Wheeldon, leaders of the Moore County Election Integrity Team and residents of Sen Tillman’s district. While the Senator advised us on how to get some of our reform initiatives enacted into law, he quickly supported our flagship recommendation to eliminate the “drive-by voter loophole” that allows any voter to avoid showing their photo ID by simply claiming they cannot get out of their car. DeLancy, Wheeldon and Park fanned out to discuss their suggested reforms with several representatives and senators yesterday. 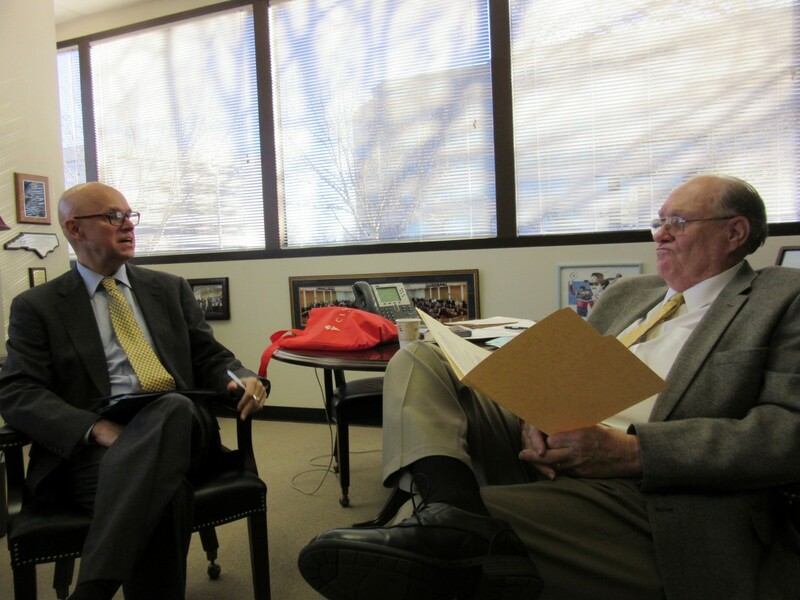 Sen Tillman was the senior senator they met and Representative David Lewis (Chairman of the Elections Oversight Committee) was the senior representative. The other four suggested bills involved increasing the severity of the penalty for people soliciting others to commit vote fraud (which is currently a Class 2 misdemeanor under NC law) and for conspiring to commit vote fraud (which is a Class 1 misdemeanor). The group also suggests that the relative severity of the crime deters District Attorneys from bothering with prosecutions. For example, making a prank call to a 9-1-1 emergency call center is a Class 1 misdemeanor and helping somebody create a false college transcript is a Class 2 misdemeanor. Voter Integrity Project is committed to restoring trust in the electoral process by investigating and preventing vote fraud.